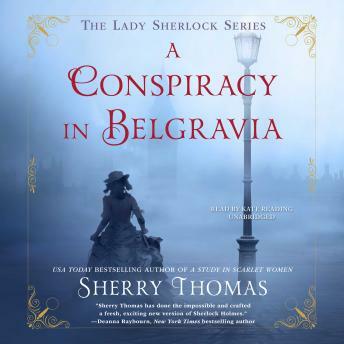 The game is afoot as Charlotte Holmes returns in USA Today bestselling author Sherry Thomas' Victorian-set Lady Sherlock series.Being shunned by society gives Charlotte Holmes the time and freedom to put her extraordinary powers of deduction to good use. As "Sherlock Holmes, consulting detective," aided by the capable Mrs. Watson, she has had great success helping with all manner of inquiries, but she is not prepared for the new client who arrives at her Upper Baker Street office.Lady Ingram, wife of Charlotte's dear friend and benefactor, wants Sherlock Holmes to find her first love, who failed to show up at their annual rendezvous. Matters of loyalty and discretion aside, the case becomes even more personal for Charlotte as the missing man is none other than Myron Finch, her illegitimate half brother.In the meanwhile, Charlotte wrestles with a surprising proposal of marriage, a mysterious stranger woos her sister Livia, and an unidentified body surfaces where least expected. Charlotte's investigative prowess is challenged as never before: Can she find her brother in time-or will he, too, end up as a nameless corpse somewhere in the belly of London? I need a dictionary for some of the words. But a great book.